I used a square shimmery turquoise scarf and tied it with the second knot from the “beautiful basics” video… but I tucked the ends in instead of leaving them out. 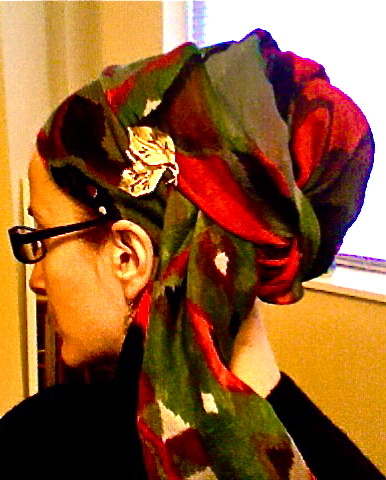 Then twisted a long beige scarf across my head and over the “bun” part, also tucking in the ends. 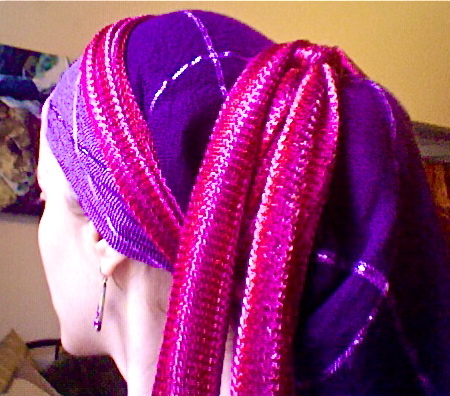 Then I put a thin braided headband on and hid the elastic part underneath the beige scarf. VERY secure! It was cold outside and I didn’t want to wear a hat. I took a grey pashmina scarf and did the “regal wrap”. Except I left the first end NOT tucked into the back. Try it! Then I pinned in a flower giving it extra prettiness as well as security. This one is basically the same as the last one, except I let the loose end be on the other side. The gorgeous gold leaf pin got me compliments all day! 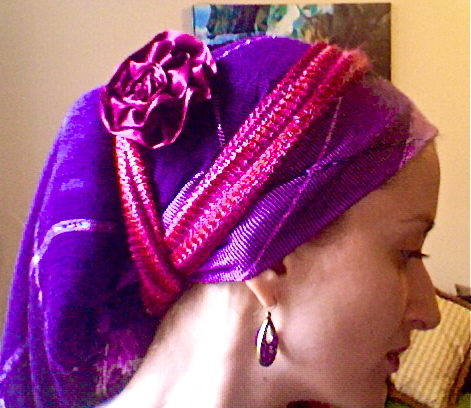 I had always wondered how ladies get it to look like they have tons of hair underneath their scarves… I figured it out! 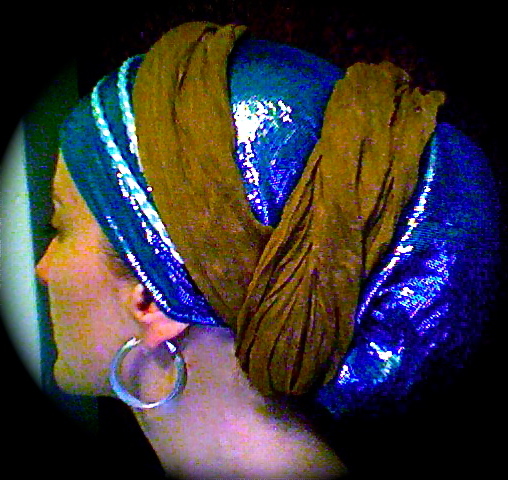 For this look, I tied a “regal wrap” with a basic pashmina and both ends tucked in. Then I simply put this shiny long scarf over it (it’s a bit sheer, but it worked very well!) and tied the ends at the bottom. Added an antique-y flower pin and I was ready to attend my friend’s wedding! This one is so simple! 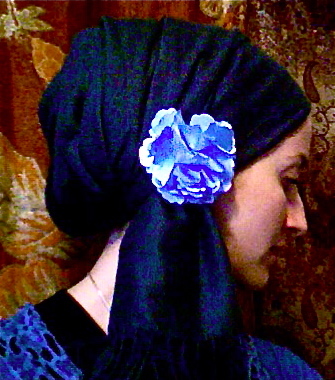 I tied my hair in a low bun, took a long rectangular scarf and placed it on my head with the ends hanging down evenly. Then I took the ends hear my face and stretched them back around my head, and pinned them with a flower pin so they would stay. Voila! I felt like I had long hair swishing around me and got many questions on how I did it. Now you know! 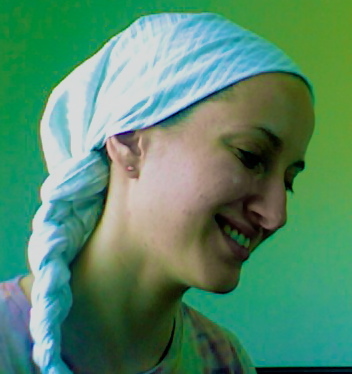 You can use a simple square scarf and braid it! Start doing the first tie in “beautiful basics”, but instead of tying a knot with the two ends, braid them into the cloth that is hanging over your head. Finish off with an elastic and you’re good to go! love the looks Andrea!! where do you buy all your pretty scarves?? Hi Adel! I buy my scarves in many places. Once I started looking I was so surprised by how much is available! Check out the “FAQ – Tips and Tricks” section for some suggestions. I’ve found gorgeous things in thrift shops, dollar stores, art shops, markets, internet and more! 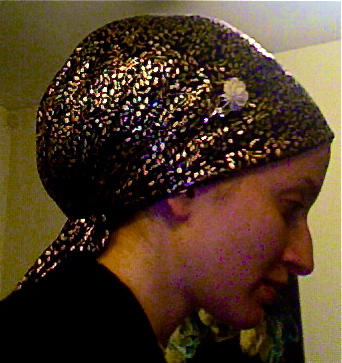 Andrea you refresh the whole idea of head covering – after a few years wearing one – one needs a refresh! Thank you! Thank you so much Gila! I hope we can all continue to be excited about hair covering! Glad you enjoyed. I love the second to last one. I actually tried it with a square scarf before and didn’t like how it appeared from the front – I’m going to try it with the rectangular. Thank you SO much! I can’t even being to tell you how much I appreciate your letting me know. 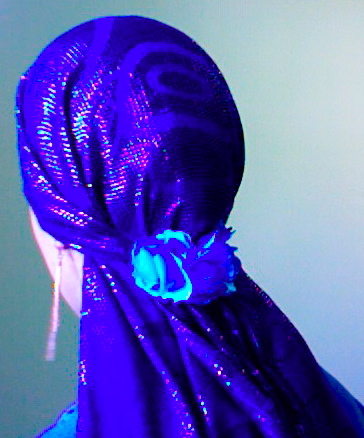 This is exactly why I created this site in the first place… I’m so glad that you are excited to be covering your hair! I really appreciate you setting up this website and sharing how to wear scarfs. Thank you very very much. You really do help a lot of women feel good about wearing scarfs. I used to cover with a sheital but my husband loves scarfs. He doesn’t like sheitals at all!. So that’s how I got more into scarf wearing. But you really help me to make them look better as mine were hit and miss!. Also they stay on more securely now so thank you. I also went and bought some of those stretchy head bands to accessories, inspired by you! Emma, thank you so much for telling me this! It makes me so happy and really encourages me to keep doing this… all the best to you and your family! I just started covering and love your site! Beautiful wrapping, creative photography, and lovely videos! Before covering, I was a long hair hair toy fanatic. I have been lamenting the loss of my hair toys…hair sticks, flexi-8s, and barrettes, but the you mentioned elastics at the end of the braided style and viola! I’ve figured out a way to use my barrettes, hair sticks, and flexis! <3! Thanks so much for your dedication to tichels! Thank you! I’m a cancer patient and can’t stand the thought of a hot itchy wig and I’m not a big fan of hats. I have a lot of scarves and will be following your instructions to keep my head protected and looking pretty while I recover. This site will be one of my favorite sources!